Fernando Pessoa was many writers in one. He attributed his prolific writings to a wide range of alternate selves, each of which had a distinct biography, ideology, and horoscope. When he died in 1935, Pessoa left behind a trunk filled with unfinished and unpublished writings, among which were the remarkable pages that make up his posthumous masterpiece, The Book of Disquiet, an astonishing work that, in George Steiner's words, "gives to Lisbon the haunting spell of Joyce's Dublin or Kafka's Prague." 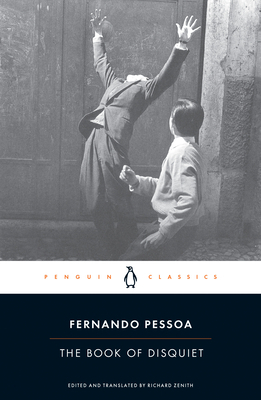 Fernando Pessoa (1888–1935) was born in Lisbon and brought up in Durban, South Africa. He returned to Lisbon in 1905. A prolific writer, ascribing his work to a variety of personas or heteronyms, Pessoa published little in his lifetime and supported himself by working as a commercial translator. Although acknowledged as an intellectual and a poet, his literary genius went largely unrecognized until after his death. Richard Zenith (editor, translator) lives in Lisbon, where he works as a freelance writer, translator, and critic. His translations include Galician-Portuguese troubadour poetry; novels by Antonio Lobo Antunes; Pessoa's The Book of Disquiet; Fernando Pessoa and Co.: Selected Poems, which won the 1999 American PEN Award for Poetry in Translation; and Education by Stone: Selected Poems, which won the Academy of American Poets’ Harold Morton Landon Translation Award in 2006. In 2012, he was awarded Portugal’s Pessoa Prize.